Those who know me on a personal basis understand my affinity for a specific U.S. naval warship. Technically speaking, that interest lies with four combatant vessels, all of which were named to honor the site of a Revolutionary War battle (more accurately, a campaign) that ended the British assaults on the remote Western colonial front. That location in present-day Southwestern Indiana would later become the seat of the Northwest Territorial government in the town of Vincennes. 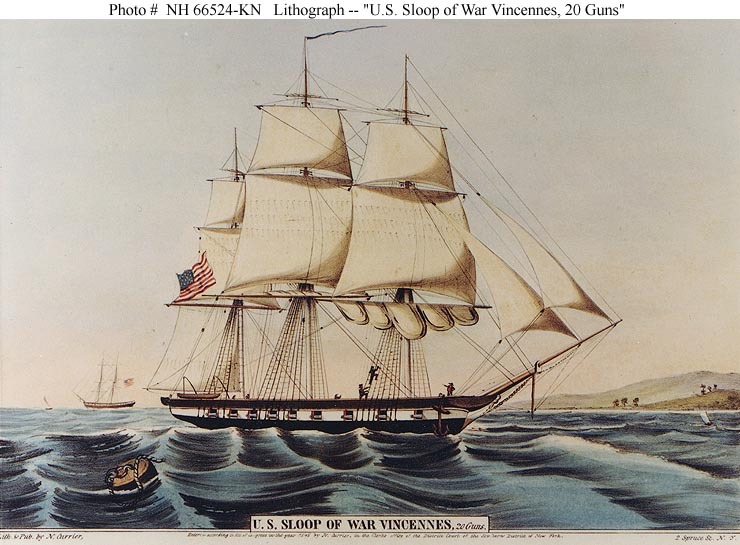 Colored lithograph published by N. Currier, 2 Spruce Street, New York City, 1845 (source: Naval Historical Center). My connection to this ship’s name extends all the way back to the place of my birth which was also the location of the commencement of an extensive 1840 charting survey of Puget Sound (in Washington State). Locations and geographical features surrounding my home were named by Lieutenant Charles Wilkes (commander of the United States Exploring Expedition of 1838-1842) and members of his team when the sloop of war, USS Vincennes (along with other ships of the expedition) was in the Sound. I can even cite some Baconesque connections with great, great, great-grandfather who served in the Ringgold Light Infantry (after he was discharged from his cavalry regiment following a disabling injury). 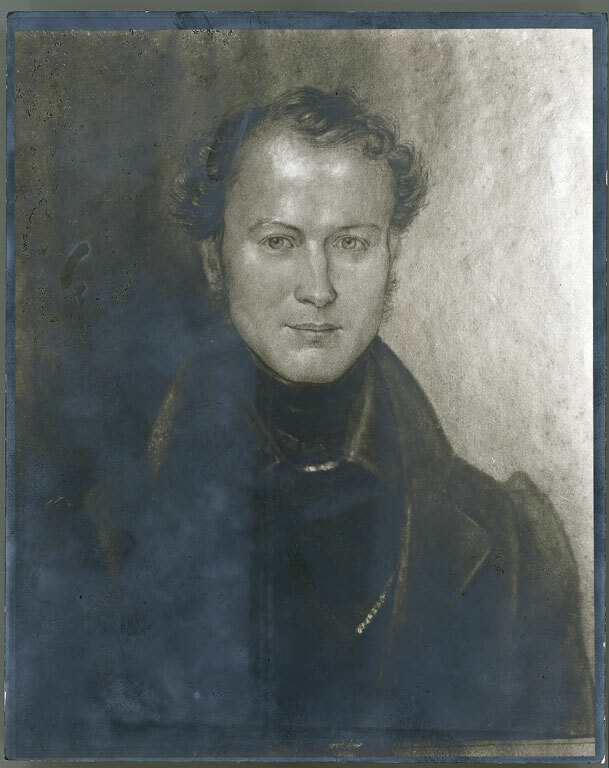 The Ringgold name was inherited from Samuel Ringgold, Expedition-member Cadwalader’s older brother (yes, I realize that this is very convoluted). My personal connection (to the ships named Vincennes) was solidly established when I was assigned to the pre-commissioning crew of the CG-49. During the first several months (leading toward the 1985 commissioning date), like many of my shipmates, I was exposed to the history of the ship’s namesake and established personal relationships with veterans of the WWII cruisers of the same name. Collecting items from “my” ship was purely functional in that I was proud to purchase t-shirts, lighters, ball caps and other items (from the ship’s store) that bore the name or the image of the ship’s crest. Many of the items I purchased in those days proudly remain in my collection while a few did manage to fade away. I am constantly on the lookout for artifacts that are connected to these ships (the heavy cruiser: CA-44, the light cruiser: CL-64) and occasionally, some quality pieces (beyond the plethora of typical postal covers) surface on the market. Fortunately, I have been successful in obtaining a few of these items, though the competition has been fierce. The ones that got away were quite stunning. William D. Brackenridge was the assistant botanist for the U.S. Exploring Expedition serving aboard the USS Vincennes from 1838-1842. The infrequency of appearances of pieces from the two WWII cruisers pales in comparison to anything related to the 19th Century sloop-of-war. During the past decade of searching for anything related to the USS Vincennes, I have only seen one item connected to the three-masted warship. While searching a popular online auction site, a rather ordinary, non-military item showed up in the search results of one of my automated inquiries. 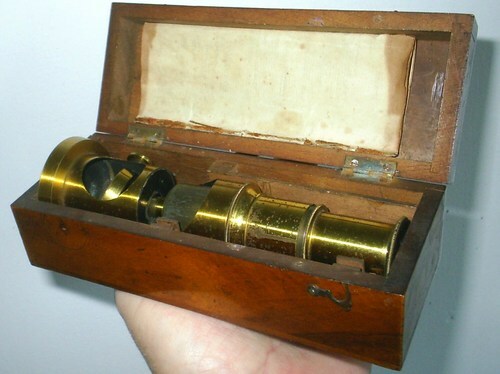 The piece, a wood-cased field microscope from 1830-1840, bore an inscription that connected it to the assistant botanist of the United States Exploring Expedition, William Dunlop Brackenridge. Admittedly, I am not in the least bit interested in a field microscope as militaria collector, but the prospect of owning such a magnificent piece that would have been a fundamentally important tool used during the United States first foray into exploration was an exhilarating thought. At its core, the goal of the (1838-1842) U.S. Ex. Ex. was to chart unknown waters, seek the existence of an Antarctic continent and discover and document unknown species of flora and fauna. Brackenridge’s field microscope would have been a heavily used item as he and his assistants would most-certainly examine the various characteristics of plant species at a microscopic level. 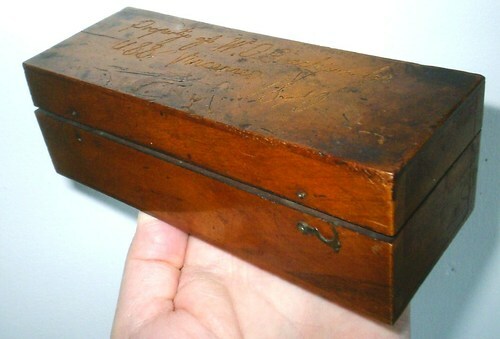 The box appears to be missing some of the securing hardware which would help to hold the lid closed (source: eBay image). Authenticity and provenance is certainly a major concern when purchasing a piece like this and the listing made no mention of any materials or means to verify the claim. However, in searching for similar microscopes, there was sufficient comparative evidence to support the time-frame in which the Brackenridge instrument was made. The box and the engraving seems to be genuinely aged and appears to resemble what one would find from a 170 year old example. 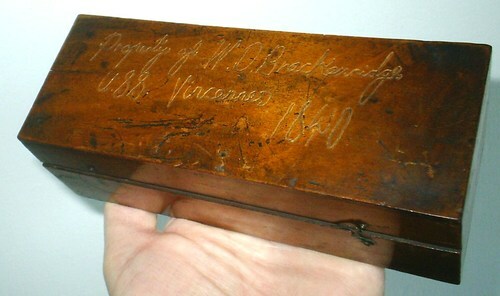 The box for the field microscope is inscribed with “Property of W. D. Brackenridge U.S.S Vincennes 1840″(source: eBay image). In my opinion, the investment was well-worth the risk and I was poised to make my maximum bid (invariably draining my discretionary savings) knowing that the closing price would exceed what I could ultimately afford. The auction closed with the winning bid ($810.58) exceeding my funds by a few hundred dollars, though I suspect that the winner had a far higher bid in place to guarantee victory. 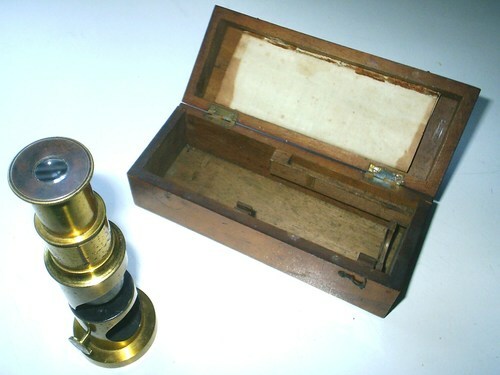 Showing the eye-piece perspective of the microscope and the wooden box (source: eBay image). The microscope sets securely into the accompanying wooden box (source: eBay image). I am a realist yet remain hopeful that I won’t have to wait another decade before another sloop-of-war piece comes to market.